It is interesting to read Adi’s posting on Oil versus Gold which is relatively stable in terms of barrel oil per ounce Gold. Were gold prices driven by oil prices, or were the two commodity prices driven up by other forces acting on each with similar effect? This brings up the important question of causation. 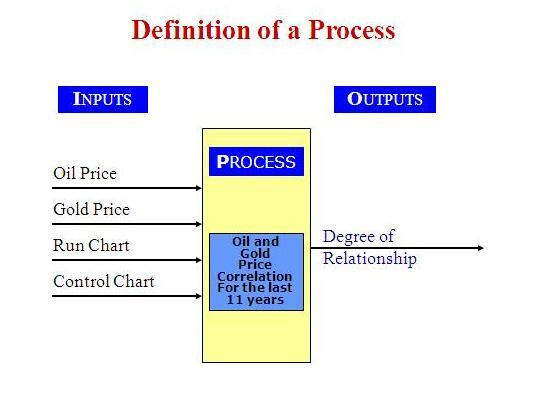 I want to know whether for the last 11 years oil and gold price is within control and has strong relationship. Computing the average Barrel Oil per Ounce Gold over the last 11 years will give me a feel for the oil and gold price correlation. 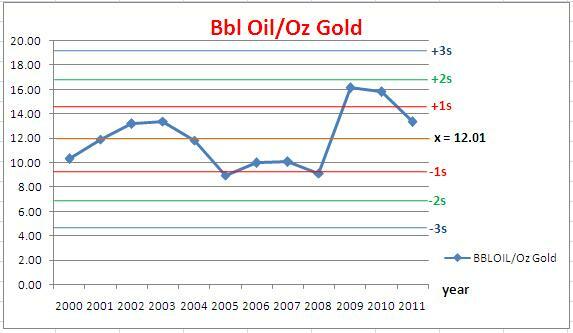 To obtain a measure of the variability in Barrel Oil per Ounce Gold , I can calculate the variance. The empirical rule states that approximately 3s = 99.73% of all the data for this Bbl/Oz gold should fall within these limits. 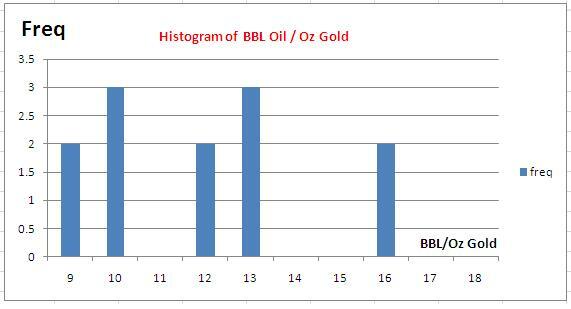 The graph below is showing that the Bbl/Oz gold price is in control for the last 11 years (2000 – 2011). 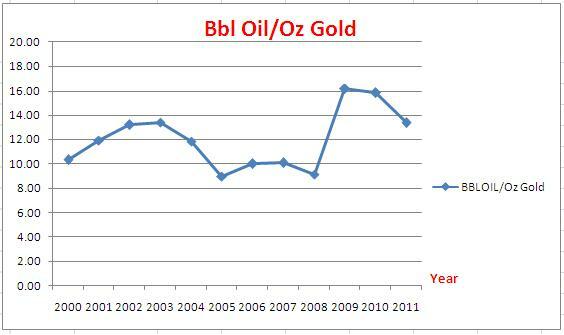 The data on oil and gold price is in average for those years. It might be some outliers if the data is shown in hourly, daily or even monthly. Price correlation is just one of many tools investors must deploy in making informed decisions. There are no absolute certainties in markets, just degrees of certainty. Basis of future cost estimation. Kiemele, Mark J., Schmidt, Stephen R. & Berdine, Ronald J. (2000), Basic Statistic, Tools for Continuous Improvement 4thEdition, Colorado: Air Academy Press, LLC. Brassard, Michael & Ritter, Diane (2010), The Memory Jogger 2nd edition, Tools for Continuous Improvement and effective planning, Canada:GOAL/QPC. This entry was posted in Candra Nugraha, Week #9, Weekly Submission. Bookmark the permalink. Very nicely done, Candra!! Interesting to map the DIRECTIONS in the price of gold vs the price of oil………. Which one lags and which one follows……? Another question is whether either or both gold and oil are in speculative bubbles right now. Just last week the President of Exxon Mobil stated that based on historic supply and demand, gold should be at $60 -$70. And I think gold is being driven by the fear of INFLATION, as the EU and US in particular continue to print money at an unprecedented rate. But anyway, you are on track to using the price of gold to project or predict the costs of your projects into the future. Why? First gold is relatively stable as we saw from from last week’s exercise. Secondly, it clearly reflects inflationary trends, which was also clear from last week’s solution. So now the only thing we have to do is convert whatever it is we are ESTIMATING to ounces of gold equivalent, and using the historic curves for gold since 1970 or 1980, it provides a very handy and reasonably reliable way of predicting costs into the future. Then if you want to take it one step further, you can use PW (NPV) to bring those costs back to today’s dollars and see if the project is still feasible. (Note- as long as the ratio of ounces to gold to barrels of oil remains constant, it should NOT impact the feasibility, but if those two start to diverge for whatever reason, it may very well have an impact.